Art Lewy is a psychologist. He recently completed two years as President of Congregation Ezra Bessaroth in Seattle, Washington. An Ashkenazi guy walks into evening services ten years ago at a synagogue close to his home, looking for a place to say kaddish daily for his mother who had just passed. This synagogue up the street was Sephardic. The culture was different than what he knew. There was a new nusach for prayer and a new pronunciation of Hebrew, amongst a minyan with obvious generations-old connections. Most knew the service by heart. The stranger was greeted, given a siddur and many times congregants checked to make sure he was following along. There was seriousness and lightheartedness. The damp, cold Seattle late winter night was surrounded by the warmth of the congregants and their ancestors’ homelands. The Ashkenazi guy left with a new vocabulary: ma’ariv was really arvit, and instead of davening at shul, we had gathered for tefillah at the kehillah. Kaddish had new words and hashkava was chanted. The hazzan graciously prepared a meldado schedule for the coming year. And maybe, just maybe, the visitor’s maternal grandmother’s maiden name Shprintzen was from the Spanish, esperanza. That was my first day in, for me, a brand-new Jewish world at Congregation Ezra Bessaroth. Seven years after my first visit, I was asked to serve as president of the kehillah. By then the minyan guys had become sources of comfort, support and spiritual growth and the kal became a temporal and spiritual home. This essay, written with love and admiration, is in honor of Ezra Bessaroth, my community. I write this essay on sabbatical in Brooklyn, just a few weeks after concluding a two-year term as president. Rabbi Marc Angel, an illustrious son of Ezra Bessaroth, graciously asked me to share my experiences as president, highlighting special characteristics of Sephardic congregations. Rabbi Angel’s invitation led to weeks of sitting in front of a blank computer screen, stumped. A simple recounting of the highs and lows of being president seemed empty. There were good days and bad days. I also am very aware that I have no special knowledge of Sephardic Judaism or of Orthodox Judaism, modern or otherwise. But what clicked finally was stories. For many years I have provided pro bono psychotherapy to immigrants and refugees, one in a long line of Jewish psychologists to do that at International Medicine Clinic at Harborview Medical Center in Seattle. My patients came from east Africa, Southeast Asia, Mexico and Central America. You may ask how could individual psychotherapy, a method of healing born from the intellectual tradition of Western Europe, be used with patients whose lives, histories, experiences, and concepts of illness bear little relation to this tradition, or how I was trained to help as a psychologist. At Harborview, I learned about culture and how it refers to layers of meaning, assumptions, practices and relationships in the context of history. I learned to listen in new, deeper ways. I became aware of what psychiatrist and anthropologist Arthur Kleinman referred to as the explanatory models1 of my patients; the cultural, personal and interpersonal significance of their symptoms, how they explained why they were suffering and what it would take for them to get better. In the words that follow, I will share stories and insights that arose for me during my time as president of a Sephardic congregation. I will draw on the guidance of psychologists, anthropologists, philosophers and rabbis in discussing strengths and challenges. I will come to this from the perspective of my passion, which is Jewish community that claims history, transmits traditions, gathers us, holds us, inspires us and carries us forward. I write this knowing that EB, like many established Jewish congregations, is at a turning point and seeking models for our second century, a matter that consumed much of my time as president. With your indulgence, I will do that from perspectives of my own Jewish history and being a learner, member and now former president of one of the oldest Sephardic and oldest Jewish congregations in America. By way of introduction, my Dad is a Shoah survivor from Berlin and my mom’s family hailed from Belarus. I was raised and spent my adult life in Conservative synagogues, including serving on boards and as shaliach tzibur. My Dad, too, was president of our synagogue growing up and we were fixtures at services year-round. I studied religious thought and Jewish studies in college but finished my education in sociology at Brandeis before becoming a social worker and then a psychologist. In the years before my mom’s passing, my day-to-day practice had flagged. EB was my first traditional community. Arthur Kleinmanin Writing at the Margin2, talked of the marginal predicament of Jews in the 20th Century, the century of the Holocaust. For my family it was a time of upheaval and displacement. My father and grandparents had moved across continents, leaving behind centuries of family history. Aside from some tales that were told, however, these events led to ruptures of historical continuity and historical memory. Traditions were lost and identities disappeared. In my home, trauma lurked behind nightmares and stern glances among adults that ended responses to questions from the children. Growing up, I lived among children in similar situations, attending new suburban synagogues with traditions only a few years old. (The synagogue of my youth, Temple Beth Am in Randolph, Massachusetts, recently closed its doors.) For me, there was more wandering, as I went to colleges, lived in Israel, attended graduate schools and made homes in many locations around the country. Settling in Seattle, I completed my education, started a family and established a career. We joined a Conservative congregation, miles from where we lived. And then Mom died. In her early seventies, she had sustained a spinal cord injury and was then found to have emphysema. She died after a lengthy illness with growing losses of physical and mental faculties. Mom was mostly cared for by my father, and I was thousands of miles away. After returning to Seattle from her funeral and shiva, I arrived at arvit at EB on a damp March evening, on the margins and looking for more than I knew. In my fifth grade Hebrew school class our teacher, Mr. Skupsky, explained his theory of time. He pointed to one post in the room marking our birth and to a second post, marking our death. Everything was linear in between, in exact order. Our empirical society with its multiple digital readouts encourages such a linear view of time. A linear view of time has its merits. We all like to be on time for our flight and get bills in on deadlines. Heaven forbid that we need to invoke the laws for arriving late at synagogue for tefillah. Yet, as Jews we know that time means something different and works differently. The first sanctification in Torah is of time, of Shabbat, and our first mitzvah, before the Aseret Hadibrot, is to sanctify time, the new month, rosh hodesh. On our festival holidays we say a blessing for the Holy One who blesses Israel who in turn blesses time, zemanim. Shabbat, shemitah and yovel are points in time where we are reminded that the earth and all its peoples and riches are A’Shem’s. Our patriarchs are famous for initiating prayer at certain times of the day. Rabbis Abraham Joshua Heschel and Jonathan Sacks describe time as the arena of the Divine-human encounter. Jewish time is not straightforward. It does not have a simple linear past, present and future. I am always surprised when reminded that events in Torah are not in linear order. In Biblical Hebrew past tense is often denoted by verbs in the future tense. Conversations in Talmud occur between scholars who lived hundreds of years apart. We are reminded that Jews of all generations, including generations to come, received the Torah at Sinai. Not only do we recount yetziat mitzrayim at our seder, but we are commanded to approach the evening as if we ourselves were preparing for the perilous journey. Philosophers have also questioned the linear view of time in ways that are consistent with Jewish theology. Henri Bergson was a Jewish French philosopher and Nobel Prize winner. Shortly before his passing in 1941, and on his deathbed, due to his fame and intellectual prominence he was offered the opportunity by the French government to pass into the non-Jewish population, but he instead opted to register as a Jew. Bergson thought a lot about time3. Here is an example that illustrates Bergson’s point. One can look at a cell under a microscope and determine its functioning in some present moment. Yet the cell carries history, through its DNA, and the cell in the present moment combines the past as the life of the cell moves into the future. To Bergson, the present carries with it everything that has ever happened and affects the present; he even went as far as to claim that the past lives in the present. The present is an actuality and the past is virtual existence carried by memory, story and ritual. The present is a realm where the past and potentials for the future interact and simultaneously exist. Why all this focus on time and what does it have to do with a small Sephardic synagogue in Seattle? At least for me and my family, Jewish time is discontinuous. Relatives, the memory of relatives, traditions and connections were lost in the events of the 20th century. One of the great things of living in Brooklyn is attending events at the Center for Jewish History where I can see glimpses of my family’s past; yet that time is sequestered in a museum. At EB, and I can imagine at other Sephardic kehillot, time works differently. The past, history, historic DNA is embedded in the day-day present moment and influences how we think of the future. Ezra Bessaroth sits on a lovely and large property in the Seward Park section of Seattle. We overlook Lake Washington, a majestic park with old growth forest and on good days we see bald eagles. The blooms of our majestic decades old cherry tree herald the spring festivals. If you can, add to this an architecturally wondrous sanctuary built of cedar timbers with an inspiring series of stained-glass installations. This is also a sanctuary built to seat over eight hundred people. I’ve been told that in the past it was full many times a year. At EB, like many American synagogues and churches, the past decades have seen a decline in membership. While our founders were visionary in many ways, a fund for upkeep of an architecturally complex structure was never set up. To the son of a good German accountant that I am, the answer was clear. Let’s leverage our property, move back into a smaller space and with our profits set up an operations endowment. Horror understates the reaction to this proposal. I was led by congregants and introduced to ancestors whose names adorn plaques, sifrei Torah, art installations, and offices. I was taken to our Presidents’ Lounge to be introduced to our illustrious hakhamim and rabbanim, and to all the past presidents of the kehillah and the Ezra Bessaroth Ladies Auxiliary. Just outside in our courtyard is a reproduction of the Holocaust memorial in Rhodes. I was offered another copy of Ezra Bessaroth: The Story of a Sephardic Congregation in case I had not read it closely enough before. Might I like to look at newsletters from the 50s, or 40s or 30s? At the time, and even up until starting this essay, I attributed this reaction to stubbornness. However, I think the issue is more one of time. I approached things with a linear view of time; the past is past, here we are in the present and we can make rational decisions about the future based on projections and balance sheets. After all, I grew up with accounts of split second and often terrible decisions that needed to be made in order to save lives. History was a luxury and the future often not beyond the next meal or train ticket. The kehillah was responding more out of Bergson’s view of time; the present and past virtually existing together in a realm that allows us to imagine our future, time as lived. Let me describe some ways this happens. Many of my good friends at EB, like Albert, Albie, Ike, Julie and Victor can be seen with their namesakes on Shabbat and festivals. In turn, the people they were named for are known and present. It is not unusual to have discussions of family trees and to discuss children and children’s children and where they all are. Another example of the present being a realm for past and future is in the EB approach to liturgy. There is painstaking exactitude in reading and pronunciation of Hebrew, reading sefer and hazzanut, according to traditional Rhodesli practice. Some of this may reflect the personality of our beloved Hazzan Emeritus, and former Boeing engineer, Ike Azose, but stories of others of our founders suggest that it is broader than that. Pronunciation, taamim and service leadership is a forum in time. I came from a tradition where traditional Ashekenzi pronunciation was mixed with modern Hebrew pronunciation. Tefillah melodies were freely improvised, even to include secular tunes. I contrast this to the careful vetting that was required by Hazzan Azose and Rabbi Shimon Benzaquen even to begin to use a traditional Ladino romanza melody, La Rosa Enflorece, for Shabbat kiddush at EB over the past two years. While life is lived forward, we look back, and back much further than the five generations currently at EB. EB’s High Holiday liturgy is filled with medieval poems from Spain. But it is not only on special occasions that time is invoked. I often have wondered why. Looking from the outside, I think part of it is history. There have been centuries to cope with the traumas of the expulsions from Spain and Portugal. There is a common founding story with uniting lines of scholarship, liturgy, art and minhagim that provides a crucible for continuity and identity through all the subsequent changes and traumas Sephardim experienced in the lands of their dispersion. But it is more than even that. The scholarship, literature, art and minhagim were not the subjects of detached history. I think of my family or of my patients at Harborview Medical Center with communities split apart and who struggle to regain the sense of time that seems to come so easily at Ezra Bessaroth. I write this knowing EB’s history and the migration from Rhodes to America. Not only were individual lives saved and changed, a community migrated, and a community reconstituted in a new land. Past, present and future are integrated into a living community that has managed to maintain identity, integrity, to be a living community in time. Several writers, many Jewish, discuss relationships, meaning, connection, and community. Psychologist Urie Bronfenbrenner4 took child development out of the lab to identify the role of active mutual accommodation between person and environment and surmised that we come to be defined, to become ourselves, through patterns of face-to-face interactions. Psychiatrist John Bowlby and psychologist Mary Ainsworth5 studied separation and what they came to call attachment. They identified how through countless intimate encounters between children and parents, humans form mental models of relationships and how the emotional and moral world works, models that carry on even after the parting of our attachment figures as the children become adults. Rabbi J. Soleveitchik6 saw in Adam II, the lonely man of faith, existential loneliness alleviated by, and yearning for companionship attained in a covenantal community. Martin Buber discussed the distinction between the world to be used and the world to be met. “True community” to Buber arises through people “taking their stand in living in mutual relation with a living center and their being in living mutual relation with one another.”7 The columnist David Brooks talks about “thick” organizations that “become part of a person’s identity, engage the whole person: head, hands, heart and soul.”8 In thick organizations we share rituals, sacred stories and watch out for one another. Teva means ark. Last fall, I had the honor to read sefer at my cousin’s daughter’s bat mitzvah, perasha Noah. I had not before connected the perasha with EB. The teva at EB sits in the middle of the sanctuary with congregants and officers on all sides. Before us, atop another ark, our aron, we read da lifnay mi atah omed, know before Whom you stand. Imagine the scene of congregants, some in seats their parents, grandparents and great grandparents occupied, other in seats that have just become home. People move seats over the course of services. There are piles of texts everywhere. The mehitza is close with communication over and to the side as greetings are exchanged and babies passed. Elders are helped to their seats. The children make their candy rounds. The teens stagger in and fall back asleep. Some pray silently, some pray aloud, many pray through talking with their friends and neighbors. Some pick up their study from the prior service. Some, like the president, pray for the 60-year-old heating system to not fail. Some are there for Hodu l’Ashem at the very start and some come in time for Adon Olam at the end. Most weeks there are congregants who come from five different continents. While Sephardim are still a majority of the congregation, that majority is no longer overwhelming, with Mizrachi and Ashekenazi Jews being a growing part of the congregation. Jews whose families trace themselves to Rhodes may no longer be a majority of the Sephardim at EB. Some congregants are meticulous in their Shabbat and day-day practices, some are there because they are Sephardic, and this is simply where they belong even as their lives have gone in different directions. Many of us are in between, building, adapting, learning and trying very hard. The room is abuzz and at the center is our teva, home to our hazzanim, hakhamim and gabbai. It is large, seats six, and stands about five feet high. There are cabinets galore whose doors open to a virtual geniza of material, birkhonim, siddurim, old messages. In the coming hours prayers will be offered, and sefer read. But much more than that will happen. Members will purchase mitzvot and donate them to others. Congregants will be called to Torah to choruses of bekhavod! and we will rise in honor of parents, spouses, friends and scholars. Semahot, losses, wishes for healing, and comings and goings will be announced. Worshippers will come forward, sometimes in long lines, sometimes from the seats, to offer donations, sometimes endless donations, as we affirm connections, heal rifts and honor our community. A sacred duty for the EB president is to be on the teva for Shabbats and holidays, tracking the service with an old page turner whose metal numbers squeak when turned and was likely the project of a well-meaning youth many years ago. In the past two years, I had a regular front row box seat to this community spectacle, to, in the words of Zorba the Greek and psychologist Jon Kabat Zinn, the full catastrophe, as I made rounds, checked in, congratulated honorees and thanked all for their generosity. This is our community in time. Services are not the only place for community, but this picture says everything about community at EB. While it is fiercely traditional (I have been told by many that Orthodox is not a Sephardic term), it welcomes, supports and honors all of us no matter our level of practice or how we got there. It is connection, affirmation, honoring and living Jewish life, past present and future, not in a museum or in a detached memory. Two years ago, we had a congregational summit and participants were asked what is the core, what needed to remain the same at EB even as we discuss the future. The most common response was community. There is a place at the table and always room for one more. My friends at EB are from our founding families. They are also from Iraq, Iran, Israel, Australia, Morocco, South Africa, Queens, Chicago, Detroit, Portland, California and small towns in Washington State. The community provides safety and affirms connection, it holds and nurtures. It is where we are reminded before Whom we stand. It is where we come to enter, in Buber’s words, into mutual relationship with a living center and with each other. I think community is how Sephardim have been able to carry time through history. Architect Frank Gehry said in an interview that if he knew in advance where a project was going, he wouldn’t go there and that he lets projects evolve in response to a problem. What began here as an exercise in organizational analysis has become a response to many problems. One is a personal need for self-reflection, a search for meaning involving faith, fear, spiritual quest, and prayer for hope on the other side. Another is a community needing to create sustainable models for its second century. I have often reflected on why I was asked to become president. Others knew the community better, had greater fundraising skills, longer time in organizations and more refined spiritual practices. I think that the search for meaning was mutual: we were all struggling for a way forward and someone outside the family was needed. But none of us knew this in advance. Arthur Kleinman said of the study of medicine and culture “we know much more than we can say or understand, we are awash in the meaning of experience; the historical flow and cultural elaboration of experience leads us to organize figures out of grounds, that are greatly relevant to particular occasions.”9 We were all trying to put into words things that we could not describe, but we knew at a level beyond words that we could help each other. For me, there was the unconscious challenge of finding a Jewish home in a time of loss and transition. Jews are masters at walking borders and boundaries. For much of our known history we have dwelled at the edges of societies, sometimes with more acceptance and sometimes with less. Even here in America, new and troubling signs of Jewish marginalization originating from the political Right and Left are now seen. I think of my grandparents and father, solid members of their societies of birth, but in the end refugees in search of sanctuary. They came to a new land, but they had no home community and they needed to construct new identities and histories. I hope in this essay I have been able to transmit a vision about the transformative role of community, a community in time, where we find meaning through entering into relationship grounded in history as a way to come home. As I wrote this essay many of my intellectual heroes came to mind. 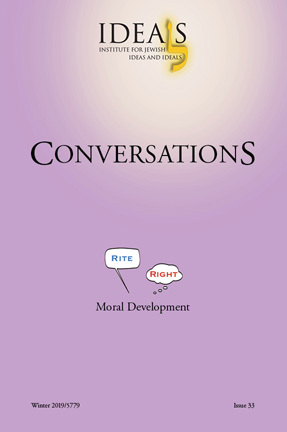 Kleinman, Bergson, Bronfenbrenner, Ainsworth, Bowlby, Soloveitchik, Buber and Brooks share a focus on relationships, yearning for meaning and community. They shed light on what I have come to see as gifts, deeply Sephardic gifts, a community like EB gives to the Jewish world. I think of the lessons from my teachers at EB. Rabbi (Emeritus) Ron-Ami Meyers recently taught me about Shimon HaTzadik’s conclusions of the 3 legs supporting the world, Torah, avodah and gemilut hasadim. Through masterful integration of sources, he demonstrated how kindness was the ikar, the key, tying together these legs. Last spring Rabbi Marc Angel, was the keynote speaker at our fundraiser, “Runway to the Future.” In a quiet moment Rabbi Angel told me a story of one of EB’s founders, Reverend Behar, that he thought captured the essence of our kehillah. One Shabbat morning, the hakham was confronted with a situation where he might have strictly interpreted a law but thereby possibly embarrass a congregant who had come to honor a deceased parent. Instead he exercised leniency about the law and strictly interpreted the ethic of kindness. This community has paved my path to a more traditional Jewish life. The path has been one of Torat Hesed, the Torah of Kindness, the path of Torah and the path of Kindness. I know that to many the label Sephardic refers to place of origin and sets of customs. But that is not the ikar, it’s not what, to my mind, Sephardic means, it is not what has kept our community whole over the centuries. The Sephardic essence is a living community in time, in history, in relation, humbly proceeding together in kindness. It is a place where I brought my dramatic but fragmented Jewish history and yearning Jewish self and became a traditional Jew, so proud of my family history and feeling whole as a member of a new community that has dealt with historic trauma and emerged with continuity and joy. It is in these ways that I can now call myself a Sephardic Jew. This essay is also written to help EB to be hopeful in a time of change. Like many older American synagogues, sociology is catching up to us as mobile, brilliant and accomplished children move away, and a new generation may not have the same relationship to synagogue and synagogue membership as we and our parents did. The search for a sustainable way forward occupies us all, and all of us know that bold change is needed. There are many details that those steeped in organizations, finance, governance and real estate will need to bring to the table. But as we do this, may we remember before Whom we stand, before the Holy One, before each other in generations past, present and future, and before the unique vision of a community in time that is Sephardic Judaism. 1 Kleinman, A. Writing at the Margin: Discourse Between Anthropology and Medicine, (Berkeley, CA: University of California Press, 1997). 3 Bergson, H. Time and Free Will: An Essay on the Immediate Data of Consciousness, (London: George Allen and Unwin, 1910). 4 Bronfenbrenner, U. The Ecology of Human Development: Experiments by Nature and Design. (Cambridge, MA: Harvard University Press, 1979). 5 Ainsworth, M. S., & Bowlby, J. “An ethological approach to personality development.” American Psychologist, 46(4), (1991): 333-341. 6 Soloveitchik, J.B. The Lonely Man of Faith, (Northvale, NJ: Jason Aronson, 1997). 7 Buber, M. I and Thou, (New York: Touchstone, 1970), 94. 8 Brooks, D. “How to Leave a Mark on People.” New York Times, April 18, 2017. 9 Kleinman, A. op cit., 99.